Project Linus Norfolk is not organised by Norfolk Quilters but a number of our members contribute. On Christmas Eve, 1995, an article titled ‘Joy to the World’ appeared in Parade Magazine. It was written by Pulitzer Prize winning photo-journalist, Eddie Adams. Part of the article featured a small child. She had been going through intensive chemotherapy and stated that her security blanket helped her get through the treatments. After reading the article, Karen Loucks decided to provide homemade security blankets to Denver’s Rocky Mountain Children’s Cancer Centre, and Project Linus was born. Since that time, over 3,000,000 blankets and quilts have been delivered worldwide. Project Linus is named after the blanket-toting character in the Peanuts cartoon strip. The strip’s creator, the late Charles Schultz, was pleased to have Linus inspire quilt makers to help sick and traumatised children. Project Linus came to the UK in March 2000 and there are now coordinators in most areas of the country. To date over 205,500 quilts have been distributed, 4,900 of them in Norfolk. Norfolk Quilters have always been a strong supporter of Linus and many of its members make and donate quilts for the project. Originally targeting paediatric cancer patients, Project Linus UK has broadened its focus over the years and now donates quilts to seriously ill, bereaved or traumatised children from premature birth to 19 years old. The project is happy to receive quilts at any time and it also welcomes nominations for recipients, so if you know of a child in particular need or would like to donate a quilt please contact us, details below. Quilts of all sizes are acceptable but suggested sizes are:- 20″ square for tinies; Cot size, 30″ x 40″; for older children 40″ x 40″ lap quilt or larger if you wish for teenagers. Please do not add embellishments such as buttons and ribbons which could come off and be swallowed. All quilts must be machine washable. If you would like to make a quilt but are stuck for ideas there are several patterns on the Project Linus website or contact the coordinators below for printed copies. Jo Parker, (north Norfolk to Great Yarmouth area) joparker09@btinternet.com, 01263 519588. Quilts may also be left at Broadly Patchwork (formerly Sew Creative Quilts) at Wroxham Barns, who kindly act as a collection point for us. For further info visit: Project Linus UK Email: projectlinusuk@hotmail.co.uk. These quilts were made from the hexagons made at the Forum in 2017 and have been handed over to Norfolk Project Linus. 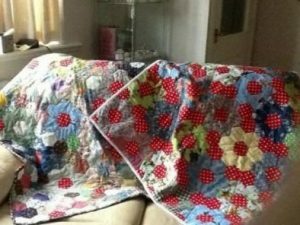 There will be another coach trip in aid of Project Linus Norfolk to The Fabric Guild,on 13th September. The cost is £18. Please ring Pat on 01953 882966 for details and booking. We have been very busy over the last few months with Project Linus Norfolk. We continue to make, collect and distribute quilts for sick, traumatised and bereaved children and teenagers throughout Norfolk. More recently tiny quilts, 20”x20” for premature babies to lie on have been requested by one of the local hospitals, together with slightly larger ones with rounded corners to place over incubators. The coach trip we organised in January to the Fabric Guild in Leicester was very enjoyable and we purchased some lovely fabric for making future Linus Quilts (and of course for ourselves). The Fabric Guild also generously donated some fabric. We had two workshop days for creating blocks which will be used in making more lovely quilts for Linus. These included a brilliant day at The Well in Ashill making Whacky House blocks for Linus quilts on 15th March. Here we were fed with delicious soup and bread followed by tea with home made cake. We also had a high output of Whacky Houses and Trees. On Friday 4th April Maureen, former Watton resident and long standing friend of Hackers, Tackers and Stuffers and Linus needleworkers, came to help us make Sunbonnet Sue and Overall Sam blocks. This was another excellent day learning a new skill in good company and producing more blocks for future Linus quilts. Hopefully we will have seen many QQ readers at Barn Ruche for our Quilts and More Exhibition from 16th -18th May which will be reported in the next edition. Thank you ahead to all those who will have helped at this event and also with the quilts for Linus, please keep them coming. We desperately need more quilts for teenage boys. Understandably we all love making the smaller pretty quilts for babies and little girls but we have more requests for those suitable for older boys than we can fulfill. You have always responded to our pleas for help and hopefully will do so on this occasion. NB Any cheques should be made payable to Wayland Quilters for Linus.